Last show of the year, so get yer ya-ya’s out and head off to the coast again! 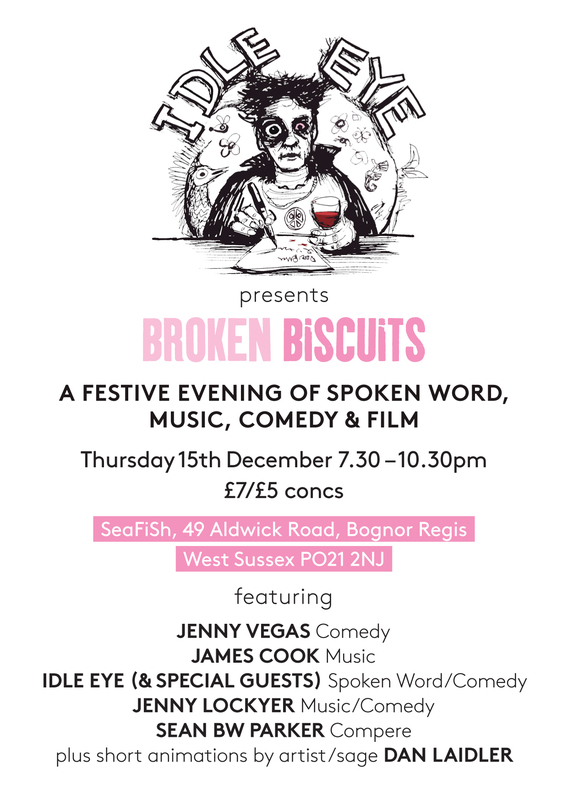 This time it’s at Bognor Regis’s magnificent SeaFiSh, the brainchild of Sean Bw Parker (who has kindly agreed to compere the evening) and inexplicably under threat from Arun District Council. It’s a venue that embraces all forms of the arts and is very much a cultural hive, so to lose it to jobsworths would be nothing short of criminal. Sean has set up a crowdfunding page here to help with legal costs, so if you can help in any way, please do. 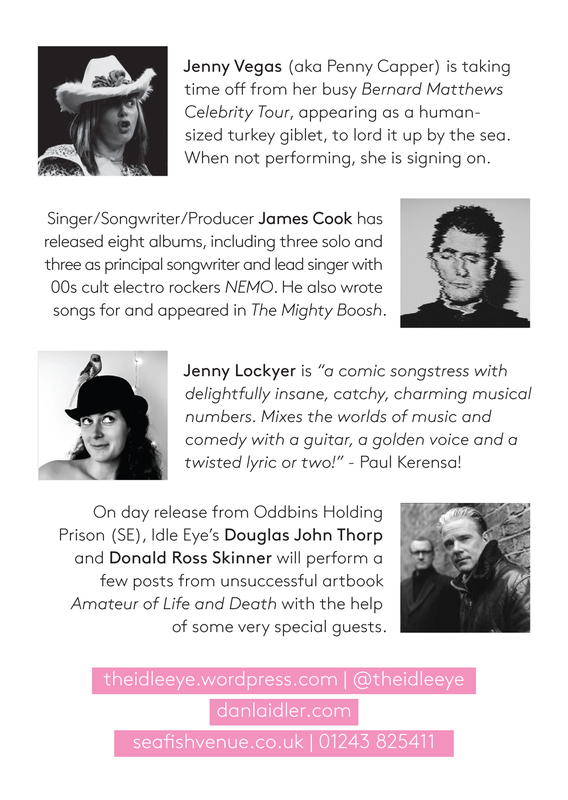 Jenny Vegas and Jenny Lockyer are back for this one (in a curious J² BOGOF deal), and James Cook is flying in specially from Berlin to be with us once again – it’s not often you get to write stuff like this. Windy will be getting a look in as well, and the grapevine informs me that there will be a Christmas address, so Idle Eye will be digging deep to find something appropriate to the season. I know, I know. There may even be hats, heaven preserve us! All in all, not a bad way to end a particularly gruelling 2016, so very much worth making the trip for (unless you’re travelling on Southern, in which case we salute you and will arrange in situ councelling as you leave the train). This entry was posted in Live and tagged comedy, Dan Laidler, Donald Ross Skinner, Douglas John Thorp, James Cook, Jenny Lockyer, Jenny Vegas, music, SeaFiSh Bognor, Sean Bw Parker, spoken word by Idle Eye. Bookmark the permalink.